They usually have their meetings in Lakeside, but this one is at Mike's BBQ in Escondido....for those of you in North County, you might consider going to this to learn about the newest bills that will affect our off-roading and riding areas. PLEASE SUPPORT SDORC ! They do a great job fighting the land use battles ! SDORC will be having a meeting in Escondido on March 27 from 6:00 to 8:00 pm at Mike's BBQ, 1356 W Valley Pkwy, Escondido, CA 92029. We will be talking about new bills affecting off-roading in California as well as events and other topics of interest to off-roaders. Come join us for dinner and meet some fellow off-roaders who care about our sport. On another subject, SDORC will be having a highway cleanup Saturday, March 30. We will meet at the Buckman Springs eastbound off-ramp of Highway 8 at 8:00 am. Please wear closed-toe footwear, long pants (for brush protection), long sleeves, and a hat (for sun protection). We will provide vests, bags, and trash-pickers. PLEASE let Doug McPheeters know if you will be there, so he can plan lunch accordingly. Email: desertdoug@sbcglobal.net, or call or text 619-249-9459. 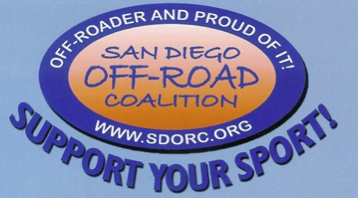 Also, SDORC will have a booth at Off Road Nights at the Del Mar Fairgrounds March 23. Come say "hi"!